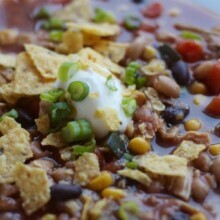 The easiest, healthiest and tastiest recipe for Slow Cooker Chicken Tortilla Soup guaranteed. Seriously, try it. toppings if desired: fresh cilantro, chips, sour cream, avocado, etc. Place onion, garlic, carrot, zucchini, corn, beans, tomato sauce, chicken and spices into large plastic food storage bag. Lay flat in freezer and store in freezer for up to 3 months. To cook, defrost bag of ingredients in fridge 24 hours prior. Pour ingredients into crockpot with chicken stock. Cook on high 3-4 hours or until chicken is thoroughly cooked. Remove chicken, shred and return to pot with strips of corn tortillas. Cover and cook another 10 minutes. Ladle into bowls and serve with any desired toppings.